No stay in Rome would be complete without a visit to the Vatican City. It is famously the world’s smallest sovereign state, with a population of fewer than one thousand, ruled by the Pope. St. Peter’s Basilica is the spiritual heart of the Vatican and of the Catholic Church itself. Its lavish interior is full of beautiful works of art including Michelangelo’s moving Pietà. He was also responsible for the design of the ornate dome, which rises to 119 metres. 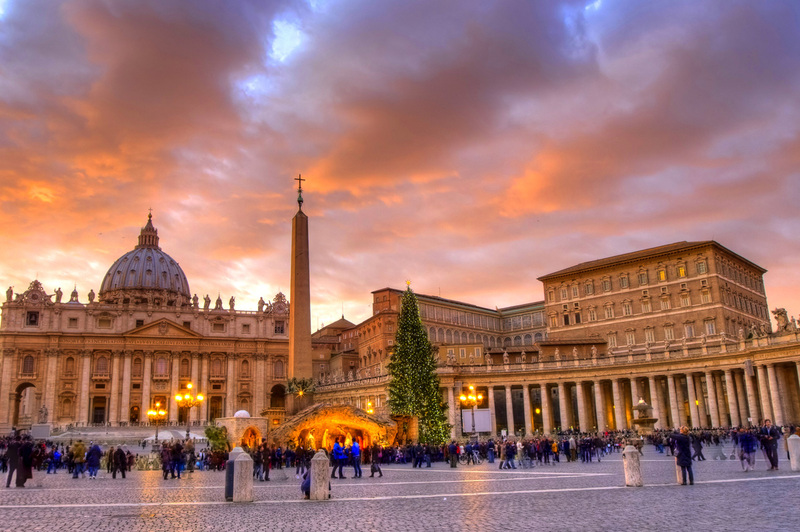 The enormous square, which faces St. Peter’s Basilica, can accommodate over 300,000 people. It is surrounded by more than 284 impressive columns, topped by statues of saints. At its centre are two beautiful fountains and a 25 metre high obelisk, transported from Egypt in 1586. 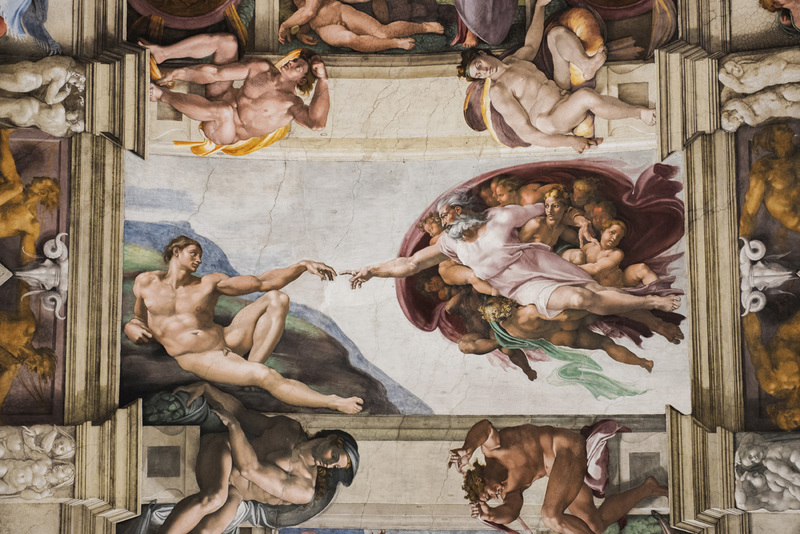 The Sistine Chapel, where popes are selected and crowned, is perhaps the Vatican’s most famous treasure, renowned for Michelangelo’s exquisite ceilings, which he spent four years painting. It is covered with frescoes painted by some of the world’s best-known artists including Botticelli, Perugino and Luca. The Trevi Fountain is a magnificently ornate structure completed in 1762 and made from travertine stone. Thanks to a tradition which came from the 1954 film ‘Three Coins in the Fountain’, visitors throw coins into the fountain hoping to find love and return to Rome. As a result, the equivalent of nearly one million Euros in coins is tossed into the fountain each year, which is all donated to charity. The Pantheon was built in 126AD and is the most significant building remaining from ancient Rome. It was built as a temple to the gods, and retains a deeply spiritual atmosphere. Intriguingly, it is exactly as wide as it is tall – 43.5 metres. Its most unusual feature is the hole in its impressive dome, which provides light into the building. Its portico is supported by 16 huge Corinthian columns, transported all the way from Egypt. Today, it houses the tombs of many of Italy’s kings. The Roman Forum is the historic heart of ancient Rome. It is a unique and awe-inspiring experience to walk through history as you wander along its main street, the Via Sacra, and take in its well-preserved temples and squares. It is hard to believe that this fascinating site lay buried and forgotten for so many years, until it was excavated in the 20th century. This Baroque piazza is one of Rome’s largest and most beautiful squares. The Piazza Navona is a popular meeting place for locals and visitors alike, who enjoy wandering amongst its street artists and dining at the many restaurants which surround the square. At its heart is the Fontana dei Quattro Fiumi, with its unusual focal point of a large obelisk.